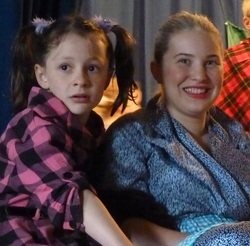 Family Friendly Productions third show "Grandma's Folk Tales" was performed at Longburn Community Centre on the 13th of July 2013, by 25 talented young homeschoolers, between the ages of 4 and 16. The play, based around a grandmother telling her grandchildren some stories, was written by Nina Donkin (director), featuring re-tellings of Snow White and the Seven Dwarves, The Pied Piper of Hamlin and The Stone Soup. Special thanks to the amazing backstage crew - Nina Donkin (director/musical director), Lydia Benton (director's assistant), Nadia Ridsdale (choreographer), also to the cast, and all the other wonderful people who helped make "Grandma's Folk Tales" a reality.